Pu`ili (alt. sp. puili) are traditionally used in love or name chants in the sitting position. Modern hula has adapted pu`ili into standing kahiko and male performances. Our pu`ili are high-quality, hand-carved, and made from natural bamboo. There are 12 to 13 strands on each pu`ili depending on its diameter. The pu`ili are sold in pairs of matching sizes. 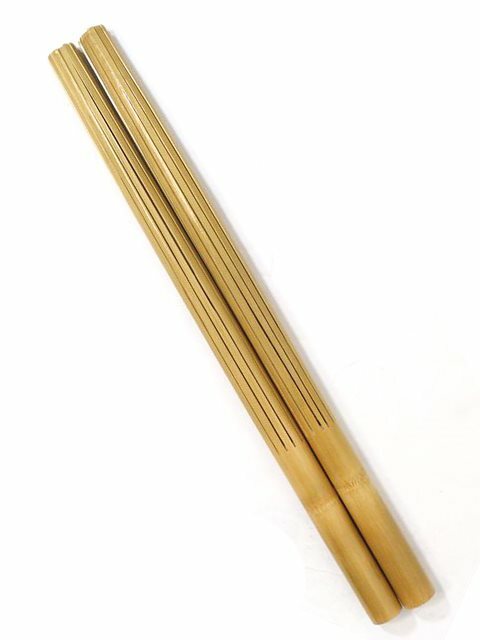 A Hula instrument manufacturer located on Oahu produces these Pu'ilis at their Laos branch. Fill in the "Request" field for a specific diameter you would like for your pu`ili and we can get you something closest to your needs. Please be aware that this product is made from natural materials thus shapes and sizes are not 100% identical. I waited a long time to purchase my Uli Uli. Aloha Outlet offered the best price and shipping to Texas. I have never been disappointed with the products I purchased from you. Everything arrives in great shape and unbroken. Mahalo nui! Very well made and gorgeous again very costly after the exchange rate and shipping costs!